Back at Arisia in January, I had the pleasure of sharing a panel on historical research with Lisa Evans. When I found out her specialty is European patchwork, I asked if she would write me a guest blog with her thoughts about my most controversial topic, Bilbo Baggins’ Bathrobe. I am delighted to present her findings below. I will add her bio and some comments at the bottom. Film costumes are not like ordinary clothing, as fabric choice, cut, and color are crucial to creating the illusion of being in another time or place. This has largely been true of the costumes for Peter Jackson’s movies set in Middle-Earth, almost all of which are carefully designed to ensure that the characters wear clothing that looks right for their culture and social class. The patchwork bathrobe worn by Bilbo Baggins in The Hobbit: An Unexpected Journey is a notable exception. The problem isn’t so much with the robe itself; its rich colors, mix of printed and woven textiles, and velvet lining look wonderfully cozy and warm. The problem is that the bathrobe is about as close to what a gentlehobbit would have worn as a polyester disco suit. Remember, the Shire is supposed to be a pre-industrial backwater with very little industry. Who brought such exotic textiles to Hobbiton? A wandering trader? Bilbo’s mother after a shopping trip to Bree? Where were they made, Minas Tirith? The Grey Havens? Harad? The other hobbits wear practical homemade wools and linens, so just where did Bilbo get his velvets and silks and damasks? Equally problematic is how Bilbo could afford such fabrics. Even if they weren’t imported, brocades and silks are neither easy nor cheap to make, especially in a farming community. Bilbo may be well off compared to his neighbors, but a yard of silk velvet would be beyond the reach of almost anyone in the Shire. The only exceptions might be the heads of the powerful Took and Brandybuck families, not a bachelor from a respectable but not rich family. Then there’s the patchwork itself. Patchwork today may be associated with thrifty housewives saving their scraps, but this became common only in the 18th century. Prior to that, the sole evidence that scraps were saved to create household items is a pillow made around 1450. Patchwork as we know it seems to have arisen around 1700, when fancy fabrics became cheap enough that a middle class woman could afford enough to piece a quilt top. Worse, the actual fabrics used to construct Bilbo’s robe – brocades, velvets, silks – bear little resemblance to those used in early patchwork. These were usually light fabrics like dress silks, printed cottons, or imported calicoes that were basted over pieces of stiff paper, then whip stitched together in geometric patterns. 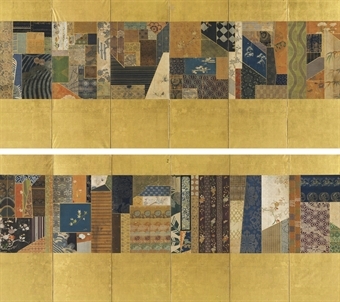 Heavy cloth rarely appears in patchwork prior to the late 19th century. This actually may be where the costume designers got the idea for Bilbo’s robe, which resembles Japanese yosegire patchwork. This style of piecing, which preserves small bits of fabric in accordance with Buddhist teachings against waste, inspired the crazy quilt fad after American needleworkers saw yosegire work at the Centennial Exposition in 1876. The results were striking and often beautiful, but they have no place in a rural, pre-industrial culture like the Shire. Ironically, there is an existing patchwork bathrobe that would be perfect for Bilbo. This robe, pieced entirely of chintz diamonds, was made around 1820. Such a robe, known as a banyan, was a common at-home garment for middle and upper class men from the 17th through early 19th centuries. It’s a real shame the costumers didn’t give Bilbo such a robe, for he would have been not only cozy and comfortable, but appropriate to his time, place, and social class. Lisa Evans is a textile researcher and historic reenactor based in western Massachusetts. She first became interested in quilt history in the early 1990’s, when she realized that there was almost nothing in print about medieval quilting and patchwork has devoted the last twenty years to researching, teaching, and writing about this fascinating subject. Her publications include a monograph on the wedding quilt of Catherine of Aragon and Henry VIII, an article on medieval European patchwork, and a paper on the relationship between historic reenactment and academic research. I noted that Lisa’s research corrects my perception of the origins of patchwork as lower class. If, indeed, it began in the upper class, then perhaps, as one earlier commenter suggested, this robe is a mathom, a special gift passed down through the generations, possibly through the wealthy and adventurous Took line. (though I still question the types and varieties of fabrics it includes without the presence of a Middle Earth Silk Route). I was struck by the image of the banyan robe–I recall seeing portraits of men wearing these, and I can readily imagine Bilbo settling back with his pipe in this style of robe. Thank you, Lisa! This entry was posted in essays, fantasy, history, movies, worldbuilding and tagged bathrobe, Bilbo Baggins, dressing gown, Hobbit films, patchwork history, Peter Jackson, quilting history, The Hobbit. Bookmark the permalink. You know, it never occurred to me that the robe might be a mathom, but it’s a great idea. Thanks so much, and thanks for letting me blog here!